This is my very first week joining in with a project over on I Heart Snapping called Living Arrows. I have been given a new camera as an early birthday present which I’m really excited to start using more; even though I have been photographing my children ever since they were born I would really love to improve my picturess and learn more about photography so this seemed perfect. Each week I hoping to share a photo that sums up the beauty of childhood. I’m beginning to realise just how difficult it is to capture a photo of Lucas, he never stays still for long enough! This is just a quiet day in the garden, we had enjoyed a family picnic and Lucas was running in and out of the washing pretending to be a monster. As you can see he doesn’t even sit still long enough to eat his apple. I love how the wind caught his hair just as he got out his ‘monster claws’. Thanks Jenny, I’m really looking forward to doing a bit more with my camera. You always have such lovely photos of your children and they will be fantastic to look back on! Bahaha this is a great photo, so much personality. 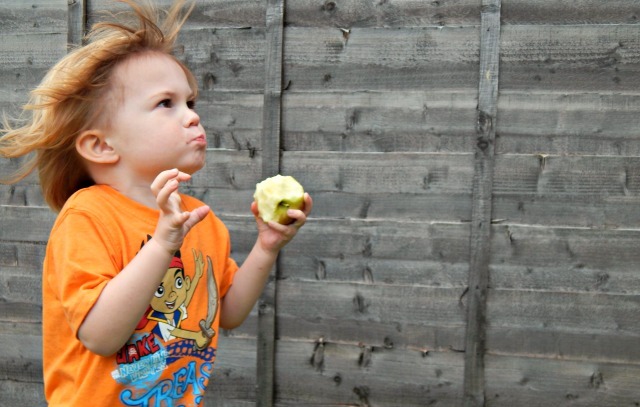 I looove watching little kids eat apples! It’s always the cutest. Yay for a new camera! I always tell myself I need to learn more about photography, especially for my daughter. I would have loved beautiful photos of me when I was young but given I was born in the 80s the photos I have of me are pretty sucky haha. I bought a nice camera and so far just keep it on auto 🙁 Good luck with your photography journey!